Tha Artivist Salutes The Jazz Lieutenant @ Arlington Cemetery!!! Get Your Copy Of James Reese Europe: Jazz Lieutenant Today!!! Video: James Reese Europe: Jazz Lieutenant Commercial: Get Your Copy Today!!! I really loved your book about James Reese Europe. The artwork was a tribute and very beautiful too. Your web site is exciting and your artful messages are profound. My name is Ellen Europe-Gomez and my children are James Reese Europe IV and Robert Foster Europe. Thank you for your interest in a true American hero. We are so proud of this brave and innovative man. Bless you and I wish you continued success in your endeavors. 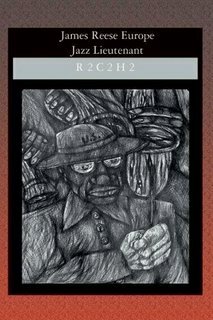 Support your favorite Artstorian in his first artastic literary effort to inform the people on the achievements and sacrifices of a forgotten jazz pioneer, civil rights leader and overall American Hero, Lt. James Reese Europe. Listed on the acclaimed Smithsonian Institute's Recommended Jazz Books for Young Kids and Adults List!! !